This post may contain affiliate links which means I make a small commission at no extra cost to you. This post today is written by an awesome guest blogger who has experienced anxiety and wants to let us know what she has found helpful. Megan realized she can successfully stay on track and feel calmer by using journal prompts, specifically using journaling prompts for depression and anxiety. Journal writing, in general, is a helpful exercise for many but adding focused journal prompts can incorporate reminders for how to keep moving forward and decrease anxiety and depression. 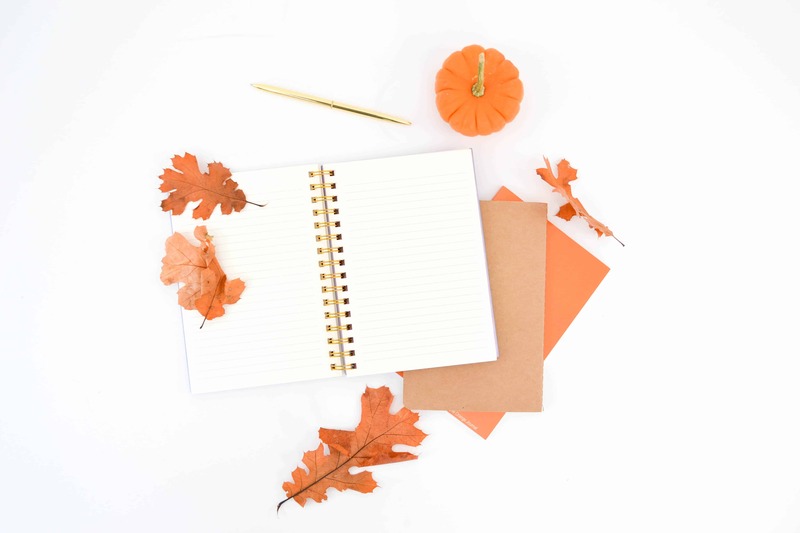 Sign up at the bottom of this post to have monthly journal prompts full of journal writing ideas emailed to you directly! I am not a mental health blogger or a mental health professional, so please note I am not giving medical advice. This is just a personal post on how I manage my anxiety. I have been dealing with pretty terrible anxiety on a daily basis since I had my son back in 2011. I am also a stay-at-home mom with two kids (3 and 7), a husband who is currently deployed, and to top it off I run a full-time business from home. So I have a LOT on my plate each day. When my husband deployed a few months back, my anxiety took a turn for the worse. And my daily medication wasn’t helping as much as it was before. I started doing some research on some other ways to deal with my newly amped-up anxiety. And that is when I came across journal prompts. These are basically journal writing ideas that helped me move through my anxiety and feel more in control. Journal prompts became a way for me to write down what was currently bothering me and how I planned to deal with it. I wrote down my goals for the month and how I was going to accomplish them. My fears, my accomplishments, things I was proud of, things I wanted to work on, and things I was going to do that month just for me: like get a coffee and sit and read a non-work related book. I found that by writing down my intentions, fears, struggles, and even my wins, it helped me to stay on track with my goals. Being solo and having two kids made me feel like the world was closing in knowing all the responsibility was solely on me. And my kid’s lives and activities were taking over what I wanted to accomplish. Heck, I would forget about what I wanted to achieve half the time. Or if I would accomplish something that I was proud of, I would forget about it two days later and think to myself, “Man, I haven’t gotten a thing done this month!” When in truth, I had! And even though it was something small, knowing I accomplished it (by writing it down) helped me stay on track and motivated towards other goals I wanted to achieve. So, if you’re struggling with depression and anxiety I really recommend that you give it a shot. Here are some of the mental health benefits from journal writing. Get monthly journal prompts sent to your inbox each month! FOR FREE! Just enter your email below to download your first journal prompt! These journaling prompts for depression and anxiety can help you stay on track with your goals and progress. Use these printable prompts as monthly reminders to reset yourself if you need to and keep moving forward. If you are looking for a fantastic journal this Bloom calendar is my favorite. It is fully motivating! It allows you to stay organized, keep track of your goals, desires, and self-care, and on top of it has a section for journaling….All in one book!